Perhaps because my work is largely on the costs of electricity generation in Ontario, most of which is contracted, I was particularly struck by Jay Shepherd's blog post dealing with spending by local distribution companies (LDC's). From 2005 to 2015, $17.8 billion in capital spending has resulted in $8.8 billion in assets (net of depreciation) being added to the distribution grid. Oh, wait. Did I say “they”. My mistake. That should be “you”. By 2015, capital spending was up to $2.23 billion per year, 258% of depreciation. Even that wasn’t the whole story. Hydro One was still trundling along, and it was still at 226% of depreciation. The rest of the industry had increased its spending to 281% of depreciation. To put that in perspective, at that rate you can replace all of your assets – assets that have an average 40 year life or more – in less than 15 years, and still have money for growth as well. 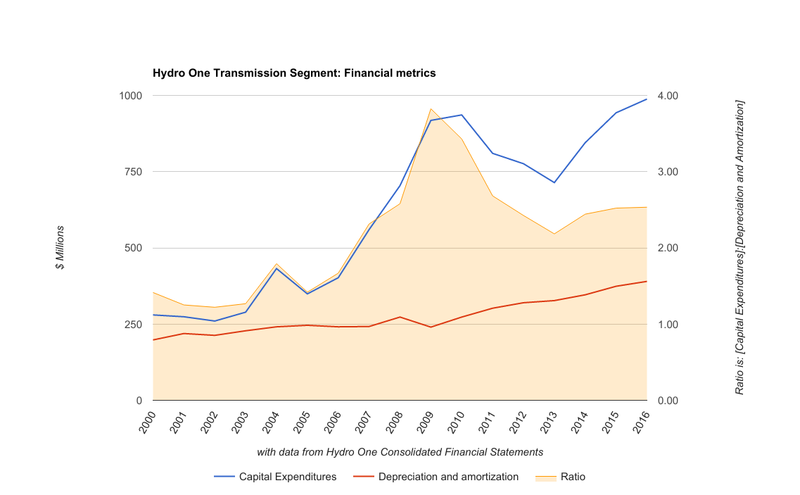 The post on distribution spending motivated me to check the data for Hydro One's transmission business. In the most recent 10 years consolidated financial statements show $8.2 billion of capital expenditures, and $3.1 billion of Depreciation and Amortization. This is worse than the distribution, both because capital spending has been 265% of depreciation and amortization for a decade, and because the average service life of transmission assets (56 years) is longer than that of distribution assets. Not surprisingly Hydro One valued transmission assets in 2016 $6 billion higher than it did in 2006. Will the $26 billion spent on distribution and transmission benefit consumers after 20 years? Maybe, but if capital spending has indicated assets are replaced every 15 years, maybe not. Why is Ontario prone to these cycles and what can be done to stop repeating them? The best explanation for this is the weakness in the governance structure of our electricity system. The government of the day faces virtually no restrictions on its ability to develop ambitious and costly experiments. The costs of these initiatives are outside of the tax base and are realized years after the plans are launched. So the government is virtually always in the position of developing ambitious plans with costs for which they are unaccountable. In Ontario, there is no such oversight. The greatest rise in rates is not due to transmission and distribution cost increases, but to the cost of purchasing electricity from generators. This list is not comprehensive (it misses natural gas-fire power plants), but by estimating capital costs on contracting capacity it introduces the methodology for estimating capital spending, and completes the listing in this post that pushes capital spending beyond $50 billion. If somebody was curious how the Premier might justify the figure, they might now be impressed. However, the Premier stated "we've invested more than $50 billion." The reason she should explain the figure is not simply to demonstrate that much has been spent in Ontario's electricity sector, but so that we understand who she is referencing as "We." I don't think it's us - bringing to the fore that famous Pete Townsend question, "Who are you?" While most distribution and transmission has some variety of public ownership, only "Big Becky" is a fully public generation project. Mattagami is a partnership, and that contract is for 50 years already, so even that doesn't justify the Premier's false "amortization" justification for delaying costs. Private Bruce Power's refurbishment of units 1 and 2 was carried out over the 10 year period over which I found it went from a typically prices supplier of electricity to the province's low-cost provider. Investing hasn't the problem - the problem has been spending poorly. Whereas Parker estimates the capital spending of the private companies on wind and solar generation, I have tallied up the cost of those contracts, and the value to consumers. Does the Premier place herself in with the wind and solar generators when claiming "We've invested..."
There are some big questions it would be nice to see economists address - instead of yelping yet again on carbon pricing. Much of the expense incurred in Ontario, it seems to me, is specifically because "we" did not invest. A major point of expensive feed-in tariff (FIT) contracts is to attract private capital. But in the recession when most of these contracts were signed, money was cheap. My limited understanding of Keynesian economics urges recession spending, but preferably capital spending on projects that will provide a benefit in the future - allowing the government to recoup the costs. 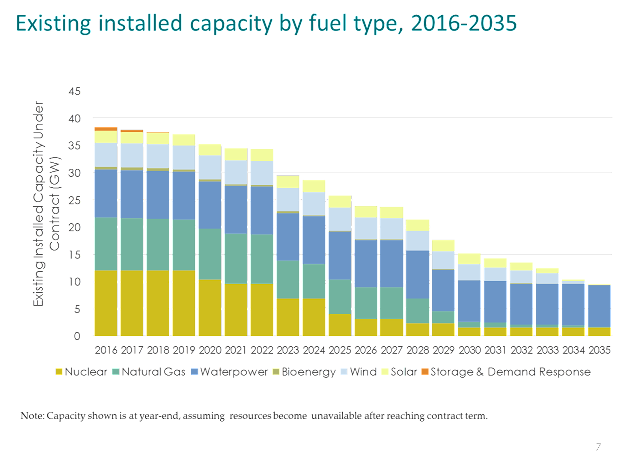 Additionally, low capital costs are particularly important in spending on electricity sources where the vast majority of the expense is capital costs (hydro, wind, solar and nuclear are some of these). Ontario's tariff deficit, which I've estimated at $38 billion was predictable. Some analysis and reporting by honest academics would help to avoid it re-occurring elsewhere. conservation / "getting trash off the books"
The big news from the weekly free local paper is often the Canadian Tire Flyer, and this week was exceptional - promising 3 packs of LED bulbs for $1 due to the coupon program of the IESO. This irks me for a number of reasons. Earlier in the week I'd found electricity exports to the states were greater in 2016 than ever before, and the real rate received for those exports was the lowest ever. Ontario also curtailed what is surely a record amount of electricity in 2016: OPG reported 4.7 TWh of potential generation lost due to surplus supply conditions. 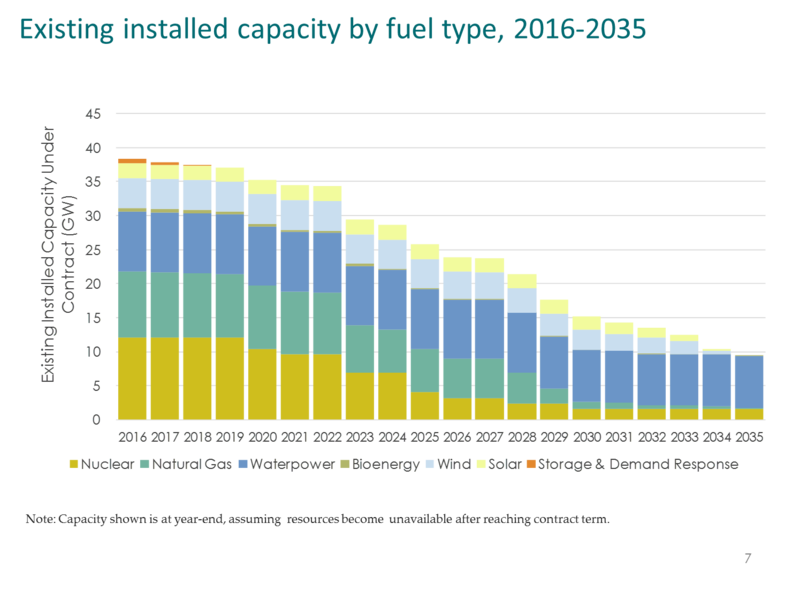 The IESO had reported curtailed wind and nuclear by this time in 2014 and 2015, but hasn't got around to admitting the numbers for 2016. Whey the do, adding up curtailed supply and the exports to the United States, sold nearer to zero than the rates paid to producers, in 2016 Ontario could have supplied another 3.1 million typical Ontario homes - for only a slight percentage more of the same overall system costs. It's understandable that the IESO couldn't yet produce curtailment (dispatch down) figures for 2016 - it would have distracted from the focus on producing coupons. I was inspired to do math on this by Severin Borenstein's Trash those incandescent bulbs today! Assuming 3 hours a day usage, 50-watts less consumption (the standard bulb in the ad is 10 Watts and advertised as a 60 Watt bulb replacement), and 10 cents/kWh (Ontario costs are presently much higher than this, but most service (aka delivery) charges are moving to fixed rates, and future ratepayers will be picking up a big chunk of electricity costs after July 1st). At 33 and 1/3rd cents per bulb, the investment pays for itself in under 23 days. At $3 per bulb (the price) the investment pays for itself in 200 days. At the IESO people are pulling 6 figure salaries to get payback time on bulbs down to 23 days by supplying coupons. The coupon value, and the salaries of the people orchestrating this, are paid for by everybody else - now and, due to the Premier's awfulness, in the future.